Agilent Technologies Inc. (NYSE: A) has introduced a precision waveform analyzer for engineers involved in design verification and validation of high-speed electrical communications systems and components. With industry-best residual jitter (below 50 femtoseconds), channel bandwidths to 50 GHz and integrated clock recovery to 32 Gb/s, the Agilent 86108B precision waveform analyzer gives engineers confidence they are seeing the true performance of their designs. This new plug-in module is the latest addition to the Agilent 86100C/D DCA wide-bandwidth oscilloscope family. 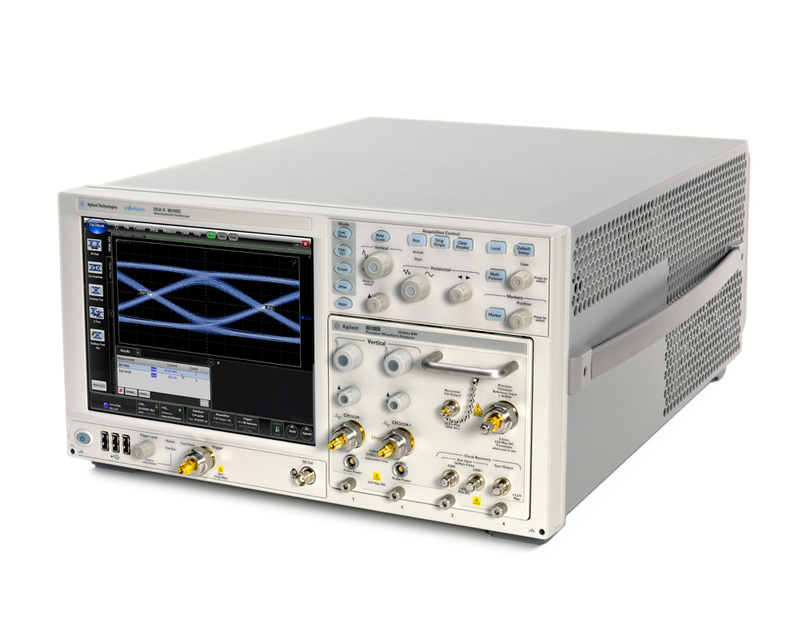 Engineers testing IEEE 802.3ba (40-Gb/100-Gb Ethernet), Optical Internetworking Forum CEI 3.0, INCITS T-11 32G Fibre Channel and high-speed proprietary systems will benefit from the measurement performance of Agilent's 86108B waveform analyzer. As data rates increase to 28 Gb/s and beyond, accurate component characterization becomes more difficult. Cabling to instrumentation degrades signal integrity, and performance margins are consumed due to non-ideal measurement systems. The 86108B's integrated precision timebase and clock recovery design, with typical residual jitter below 50 fs rms, enable it to minimize potential problems. With this plug-in module, Agilent's wide-bandwidth oscilloscopes meet the requirements of advanced technologies better than any other oscilloscopes on the market today. Continuous data-rate coverage from 50 Mb/s to 32 Gb/s, peaking control and adjustable loop bandwidths to 20 MHz also allow the clock recovery circuit to provide a golden PLL response for accurate and compliant device characterization. In addition to the performance benefits offered by the Agilent 86108B, the integrated instrumentation-grade clock recovery circuit allows the module to trigger directly from single-ended or differential data signals. This eliminates the need for a separate trigger input. The module also integrates high-bandwidth pickoffs and phase-matched cables, which significantly reduce setup complexity, maintain signal integrity and make it easy for users to start making accurate measurements quickly. An auxiliary clock-recovery input circuit allows engineers to analyze extremely low-level signals, or signals that have been closed due to severe inter-symbol interference, by triggering the scope using a separate synchronous data (or clock) signal connected to the 86108B's auxiliary CR input. The on-board phase detector enables a flexible and accurate technique to determine PLL bandwidth/peaking on devices with either clock or data inputs and outputs. The integration of several instrumentation blocks in the 86108B provides significant cost advantages in addition to the highest measurement accuracy. The cost of the system (an 86100D mainframe plus the 86108B module) is far below any comparable real-time or equivalent-time oscilloscope solution. Additionally, Agilent offers the 86108B with bandwidth options of 35 GHz and 50 GHz and clock recovery data-rate options of 16 Gb/s and 32 Gb/s. Both bandwidth and clock recovery options are upgradeable, so users can enhance their instruments as their designs warrant. "These new high-speed standards are challenging the engineering community like never before," said Jay Alexander, vice president and general manager of Agilent's Oscilloscope Products Division. "Agilent is pleased to provide engineers with the 86108B, a new gold standard engineered to characterize their designs more easily and accurately. This product is an essential tool to help high-speed chipset suppliers remain competitive." Lowest intrinsic jitter (< 50 fs rms typical), which provides the most accurate measurement waveforms. Widest continuous clock-recovery range (50 Mb/s to 32 Gb/s), allowing for easy measurement setup and compliant device characterization. High-bandwidth receivers (35-GHz and 50-GHz options), providing a faithful and accurate representation of the incoming signal. Integrated triggering architecture, allowing simple connection schemes, analysis of low-amplitude signals and the elimination of the clock-data delay that can corrupt jitter measurements. An internal phase detector that enables accurate measurements of PLL bandwidth, jitter transfer and jitter/phase noise spectrum. The Agilent 86108B precision waveform analyzer is available now, with prices starting at $80,000. Further information about the Agilent 86108B is available at www.agilent.com/find/86108B. Images of the Agilent 86108B are available at www.agilent.com/find/86108B_images. Further information about the Agilent 86100D DCA-X wide-bandwidth oscilloscope family is available at www.agilent.com/find/dcax.